Jomon Paul discusses his role as director of research in Coles College of Business. Chao Mei is using VR and a custom-built computer program to develop an innovative method of therapy. 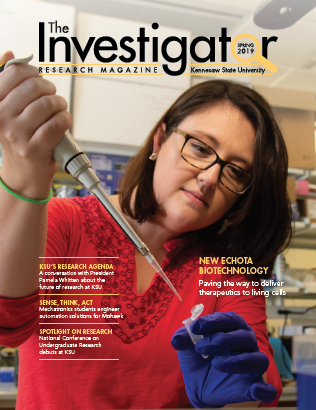 KSU professors discuss recent NIH grant on Closer Look with Rose Scott (2:42 mark). Partnership harnesses research and innovation of students and faculty. The Office of Research invites grant proposals for faculty projects that have strong potential to attract external funding. The IRB provides workshops or topic-based info sessions for groups, departments or colleges. The Office of Research supports externally funded research, service, and creative activity at Kennesaw State University. The staff provides funding information, technical expertise, and assistance in proposal development and submission. All proposals must be routed and submitted through the Office of Research. When awards are received, the staff assists principal investigators in the administration of their projects. For more information on the proposal and award process, please review the Sponsored Awards Cycle. Check out our new research magazine! Special thanks to the writers/copy editors - Jaden Austin, Emily Deibler, Elizabeth Friedly, Richard Grant, Heather Hankins, Jennifer Harb and Jennifer Ramsey and KSU Creative Services for helping bring this project to completion.